Every Saturday I am going to post a new party idea, with my suggestions for food, drink, music and decor. If you have any ideas for a future Saturday Soiree, please let me know! Today, we are going to throw a Low Country Boil. Low County Boils are a casual and easy way to entertain and feed guests. The rule of thumb for making a low country boil is that the bigger the crowd, the bigger the pot needs to be. Add the potatoes to large pot, and then five quarts of water and seasonings. Cover pot and heat to a rolling boil; cook 5 minutes. Add sausage and corn, and return to a boil. Cook ten minutes or until potatoes are tender. Add shrimp to pot; cook 3-4 minutes or until shrimp turn pink. Drain. Serve with cocktail sauce. Serves 12. Decor- Spread newspaper over the top of your table(s) for use as a tablecloth. LCB are perfect for any setting but are particularly great outdoors, less mess for you! There is no need for a plate, the traditional way to eat is straight off the table. For accent lighting, I like to drop a tea light into a mason jar and put several of these around. Gerber or Shasta daisies are the perfect flowers for this occasion. Music- An Ipod mix of something soft and a little country, such as Lyle Lovett, Nickel Creek, EmmyLou Harris and Robert Earl Keene. Drink- Abita Amber. This drink pairs well with spicy food. I would also serve individual coke glass bottles and homemade lemonade for those who do not wish to drink alcohol. This entry was posted on 8:20 AM and is filed under dinner parties , low country boil , southern parties . You can follow any responses to this entry through the RSS 2.0 feed. You can leave a response, or trackback from your own site. We love a Low Country Boil in my house and it is such a great and easy thing to throw together for having friends and family over. Love all of your ideas! I've never heard of a Low Country Boil, but it sounds yummy! Mason jar candle holders is a brilliant idea! 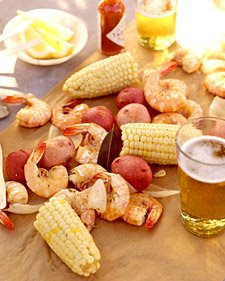 I've always wanted to do a Low Country Boil - maybe we'll finally try it this summer! Thanks for posting! We have crawfish boils here in Texas...since I don't love crawfish, it looks like a Low Country Boil Get-Together might be in order!